If this is your first time joining us you will love it. It features Close to my Heart Consultants from all over Canada showing you their projects. The Hearts of the West team was founded by Nancy Klein in Cochrane, Alberta. This month's challenge is based on the Confetti Wishes paper pack, brought to you by the new Annual Inspirations Idea Book and hand picked by Nancy Klein. If you came from Valerie's blog then you're in the right place, but since this is a circular blog hop, you can start anywhere! Just in case, the complete list of hoppers will be at the bottom. So, as always, grab your coffee, tea, or water, relax, and hop around the team with us. This month, I wanted to do the Confetti Wishes Workshop on the Go and realized my Artbooking cartridge has been borrowed so I opted for my own layout. And here it is! I used the Kraft cardstock as the base and a 4.25" X 12" piece of Canary. I LOVE the paper with the candles and just cut around the edge to get the wavy effect. The circles are cut with the CTMH 1 1/4" circle punch and stamped with the circles in the Confetti Wishes WOTG stamp set using Lagoon, Pear, and Thistle. 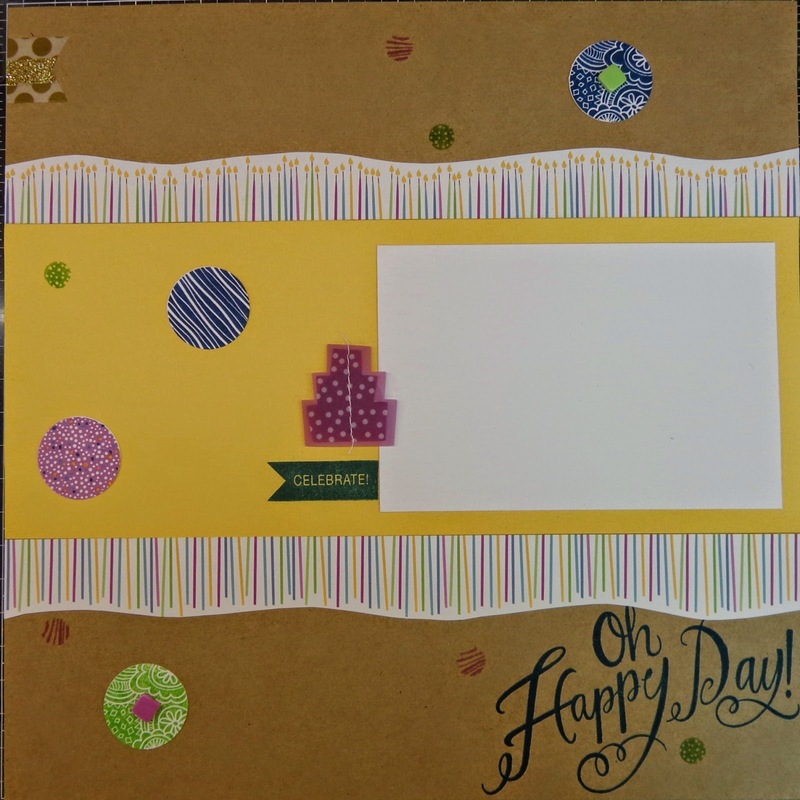 Oh Happy Day and the Celebrate banner were stamped with Lagoon directly onto the cardstock. I am really happy with how this washie tape/shimmer trim combo turned out! 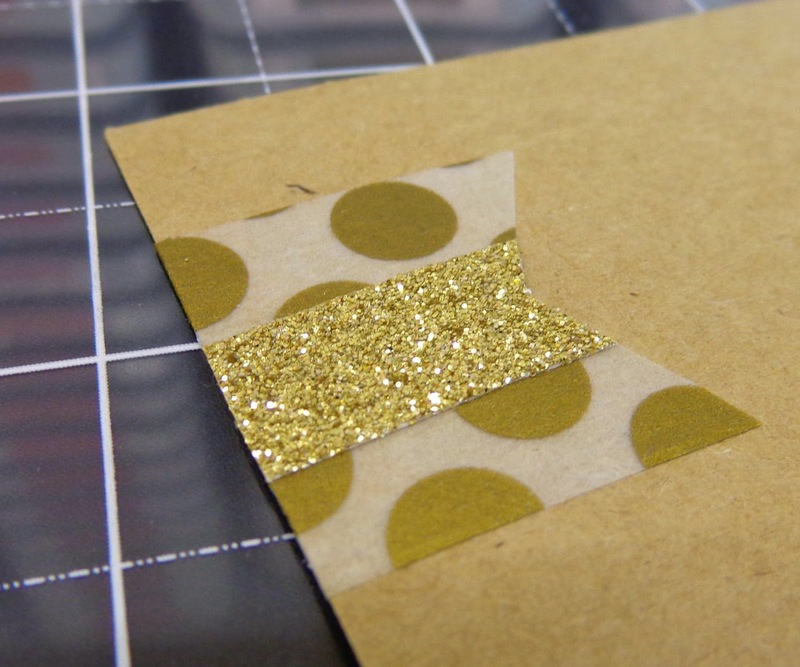 I stuck a piece of shimmer trim onto a piece of the CTMH Gold Dot Washie Tape and then cut it into the banner. I added a couple of the little square dots from the Confetti Wishes Assortment too. The circles needed something and I think this adds just the right touch! The Confetti Wishes Assortment that comes with the WOTG is so cute!! I love the stitching and layering used to make them really pop! Thanks for joining us this month and come back next month to see what creative projects we can bring to you! If you have seen anything in our hop that would look awesome in your own paper crafts, please contact your local Close to my Heart Independent Consultant! Thank you for stopping by and please feel free to leave a comment. Your next stop on your trip is Kerry's blog. Happy hopping!! Welcome to my small part of the March Use Your Stash blog hop! This month, our theme is "It's not easy being green". It reminds me of Kermit the Frog sitting by a pond singing in one of the Muppet movies! If you got here from Wendy's blog, you are on the right track, but if you get lost, just return to Terry's blog where you will find the list of hoppers. I LOVE GREEN! It reminds me of hot summer days and warm nights sitting on the deck watching the stars. So when I saw this month's theme was GREEN, I was so there! Then when I actually started, I thought it was WAY too much green and it didn't really appeal to me. So I went looking through my stash and found the perfect compliment! I made a set of cards using four White Daisy card bases (4.25" X 5.5"), the Paper Fundamentals Adventure Assortment (Z2032) and some small scraps of Chantilly. I found two sets of the Lucy Complements we had a few years ago. These are rub-ons in these pretty pinks, greens and yellows. I LOVE them and they added just the right contrast to the green! I also used the Silver Shimmer Trim (Z1799) on one card and some contraband pearl trim I had in my ribbon stash on another. I also added some of our Colour Ready Ribbon. Not sure I like the Happy Birthday stamped directly on the green card and may still change it. That's my project for this month. I hope it has whetted your creative juices, and I welcome your comments. From here, head on over to Darlene's blog for some more great artwork! 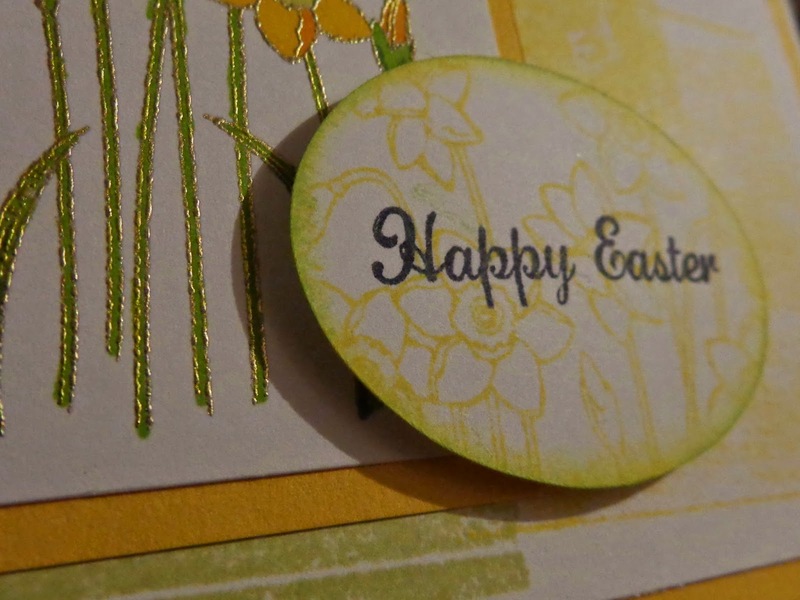 Welcome to our March Blog Hop featuring Easter Fun creations. To purchase any of the items seen in our blog hop today, please contact your local Close to my Heart independent consultant to place an order. We hope that you will take the time to leave comments on our posts, as we love to get feedback from our viewers....whether it was something that you really liked or some new technique that was used that you would like to learn how to do. By leaving us comments, we get to hear what you like, and what you want to see. Thank you… now on to our hop! If you have just hopped onto my blog, you can start here as this is a circular hop, but if you want to follow us across Canada then please start at the beginning and join Michelle at My Creations with Michelle. If you came from Terry Ann's blog at Just a Tad Crafty then you are in the right place! 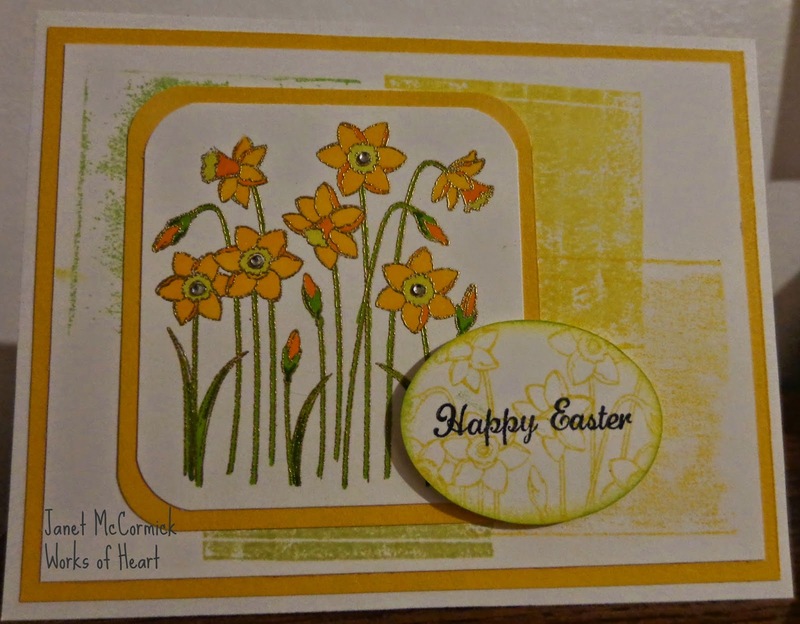 When I saw the stamp set A Little Note (A1171) and it screamed Easter and Spring! I love daffodils and can't wait to see them in the store so I can buy bunches of them! I first used my 2" X 2" block to create blocks of colour on the background White Daisy cardstock. I will list all of the colours at the end of this post. I made the blocks of colour overlap a bit as well. I stamped the image with VersaMark Ink and then heat embossed it with Gold embossing powder (Z2066) before colouring with our wonderful Shin Han Touch Twin markers. The little oval is cut using the CM oval cutter that I have had for years! It is handy when I only one or two ovals and don't want to dig out my Cricut. Happy Easter is from the Just to Say stamp set (D1629). 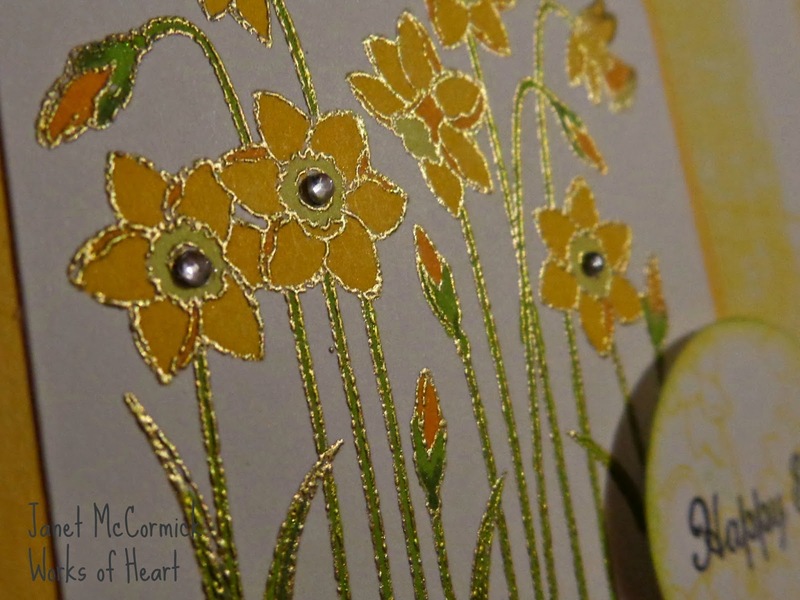 It looked a little lost on the oval so I stamped the daffodils over top to add a little something. I then distressed the edge of the oval with Canary and Sweet Leaf inks to add dimension then popped it up with some foam tape. That's it for me this time around! As promised, here is a list of the materials I used. If you would like any of these for your own, please contact your local Close to my Heart independent consultant. Your next stop on the Cross Canada Hop is Kathy Skipper at It's a Girl Thing. If you get lost along the way, you can head back to Michelle's blog, http://mycreationswithmichelle.blogspot.ca, as she has the complete list of hoppers. We all like to be happy, and the March Stamp of the Month is all about Happy! I love the frames and the little borders! 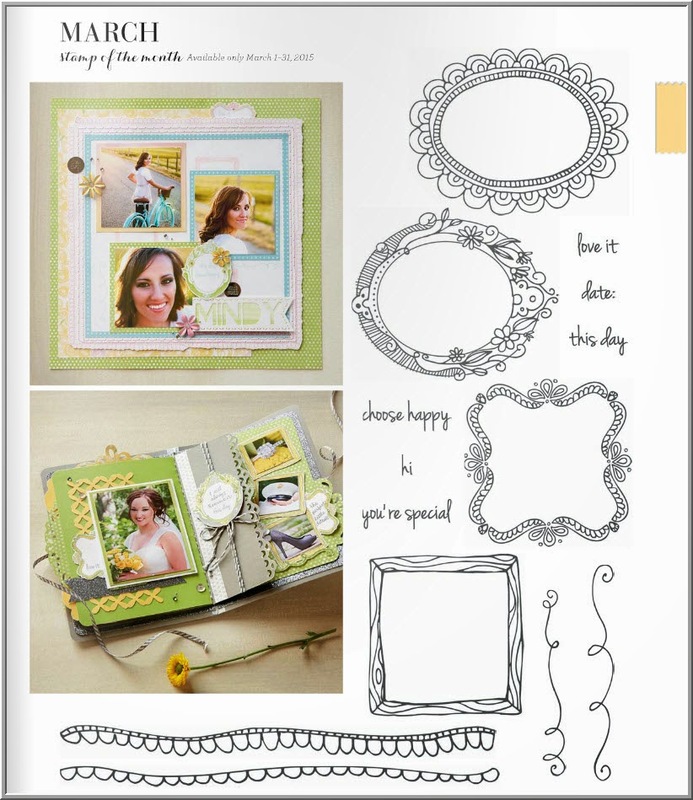 The layout and mini-album in the pictures show how the frames can be used as journalling blocks, or as hidden message tags. The little squiggles can be used on their own as accents, or stamp them on your project and use it as the string for a balloon! So cute! This stamp set is available for only $5 when you place an order of $50 or more until March 31. For more information or to place an order, please head on over to my website! To join my Close to my Heart team that is! From March 1 to 31, when you become a Close to my Heart independent consultant, you will receive the GORGEOUS CTMH Shoulder Tote absolutely FREE as part of your new consultant kit!! This bag is sturdy, huge and oh, so pretty! What's more, if you have $300 in commisionable sales in the first 40 days, you will receive the phenomenal Rolling Tote as a free bonus! Imagine how organized and professional you will be as you transport your product to gatherings and workshops! If you are interested in joining Close to my Heart, please visit my website at http://janmccormick.ctmh.com where you will find all of the information.